Yes, You can access your Facebook account with 3 different passwords . I was surprised when i read this message posted by one of my friend in Facebook. So , immediately, i tested whether it is true one or not. Yes, it is working. This one will be interesting one. You can toggle the case of your Password and use it. For instance, your are using "breakTheSecurity" as your default password. In this password, 'T' and 'S' is Capitalized. if you toggle the password case, then your password will become "BREAKtHEsECURITY". If the first character of your password is in lower case and you change it to Upper case, you can still login with this one. 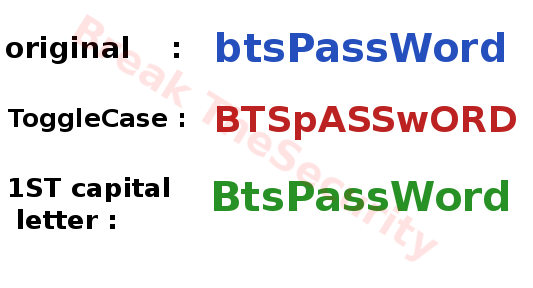 For instance, the original password is "breakTheSecurity" . In this password, the first character 'b' is in lower case. If you capitalize the first character, then your password is "BreakTheSecurity". It is not security flaw. It is just feature provided by Facebook. "We accept three forms of the user's password to help overcome the most common reasons that authentic logins are rejected. In addition to the original password" Zdnet quoted as Facebookspokesperson saying. " we also accept the password if a user inadvertently has caps lock enabledor their mobile device automatically capitalizes the first character of the password." 3. You can use use your mobile number ( if you have added your mobile number in Fb). Just want to say your article is as amazing. The clearness in your post is just great and i could assume you are an expert on this subject. Well with your permission allow me to grab your RSS feed to keep up to date with forthcoming post. Thanks a million and please carry on the enjoyable work.